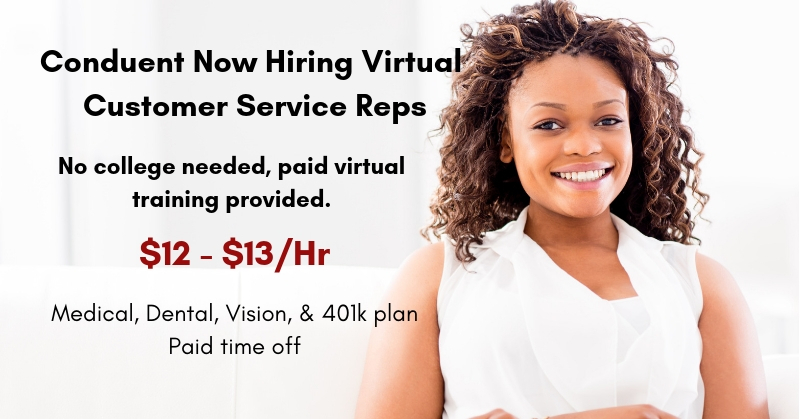 The company is hiring f/t Work From Home Customer Service Reps. No college needed, paid virtual training provided at $12/hr. Increase to $13/hr. after 90 days. Alabama, Arizona, Arkansas, Colorado, Connecticut, Delaware, Idaho, Indiana, Iowa, Kansas, Kentucky, Louisiana, Maine, Michigan, Mississippi, Missouri, Montana, Nebraska, Nevada, New Hampshire, New Jersey, North Carolina, North Dakota, Ohio, Oklahoma, Pennsylvania, Rhode Island, South Carolina, South Dakota, Tennessee, Texas, Utah, Vermont, Virginia, West Virginia, Wisconsin, Wyoming. This entry was posted in Customer Service Jobs, Hiring Companies, Work at Home Jobs and tagged Conduent. Bookmark the permalink.